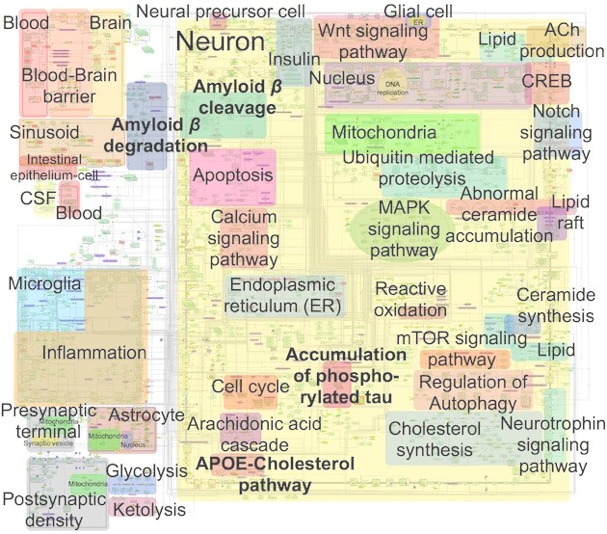 AlzPathway is a publicly available pathway map that comprehensively catalogs all signaling pathways in the field of Alzheimer's disease (AD). We collected and manually curated over 100 review articles involving in AD, and have built an AD pathway map by utilizing CellDesigner. AlzPathway is composed by thousands of molecules and reactions in neuron, brain blood barrier, presynaptic, postsynaptic, astrocyte, and microglial cells and their cellular localizations. AlzPathway is the comprehensive map of all intra, inner and extra cellular AD signalings for deciphering pathogenesis of AD.